My ideal date night is dreaming with my husband about ways to enhance our mid-century home. We both agreed our bedroom felt a little stark and needed a cozy (or should I say ‘hygge’) makeover. 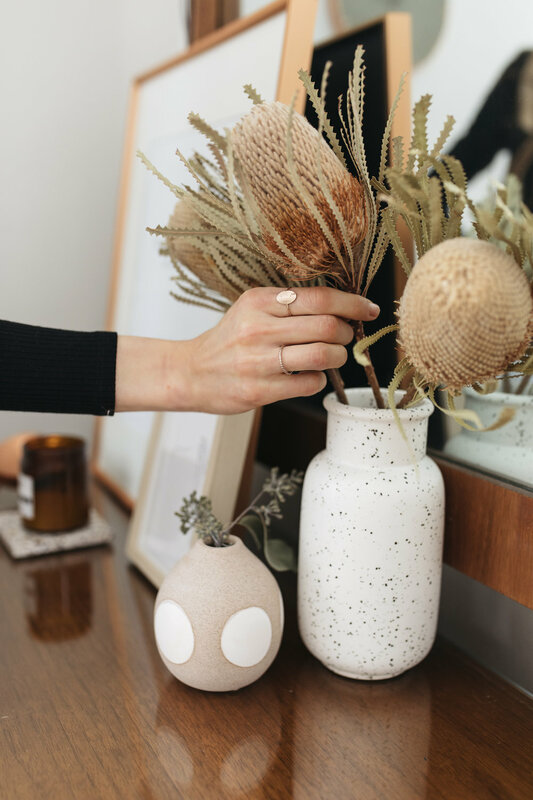 I’m never one to wait to improve something until I have ‘more money’ or the ‘right time’ arises, so I found ways to warm up our space on a budget, in under an hour. Work from the corners out. When giving any room a facelift, I like to start with the corners. Pick a corner and arrange your furniture, wall hangings, rugs, and knick knacks to compliment each other. Creating space and layering the elements, such as placing a small frame in front of a larger one, adds depth and design to your decor. Fill in the gaps with pillows, sheepskins, vases, plants, stacks of magazines, candles, whatever you fancy! I get it, not everyone is an artist, but I do believe everyone is creative. Tap into your creativity by making your own artwork. Pick up a watercolor set or draw a trendy minimalist line design and pop it in a cheap photo frame to hang on your wall. Not feeling like fussing with a paint brush? Print out a quote or photo to frame. Buy flowers that never die. Justin and I have an ongoing tradition where he only buys me dried bouquets - he only likes spending money on things that last and I have a slight obsession with dried flowers. No they don’t smell like the fresh ones, but you never have to worry about changing them out every week! I recently found these GORGEOUS dusty blush blooms at Anthro and kind of want to put them in every room. Swap your pillow + duvet covers. If you’re somebody that either A) loves change or B) wants a new color scheme every few months, you understand that urge to switch up your entire room. Rather than buying a new comforter and pillows every season, invest in a duvet and pillow inserts. Every time you want to change the colors or patterns of your linens, shop the clearance section (I check Target, H&M Home, and West Elm) for discounted duvet and pillow covers then swap out old ones for a fresh look! Brighten up the room with inexpensive lighting. Adding the right touch of light through budget-friendly fixtures or stringing starry lights majorly brings comfort to your room. Ikea has tons of options for lighting - I attached these matte black clamp lights on top of our 1960’s walnut dresser to brighten the mirror. Rose gold starry lights are another stylish detail that you can attach anywhere. I put two strings across our curtain rod to frame the window and make our bedroom feel magical at night. Whether you’re looking to update your living room or dorm, these tricks will apply to you too! 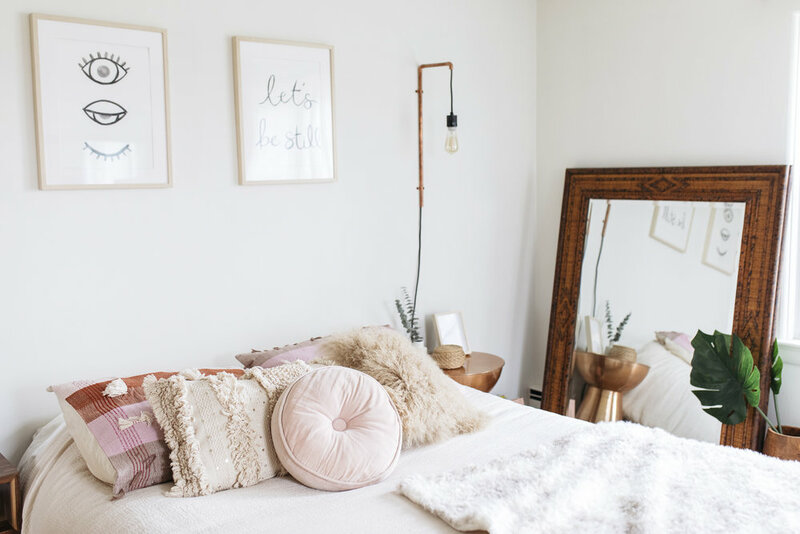 Adding minimal touches of artwork, dried flowers, inexpensive lighting, fresh linens, and stacks of inspiring reads give your room a happy vibe - so inviting you might find it hard to leave.